● High quality Taut Band movement. 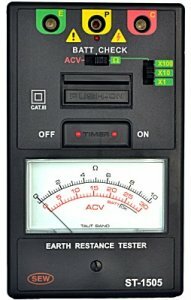 ● Capable of measuring earth resistance and earth voltage. and “TIMER ON BUTTON” are pressed together. ● This will keep test “ON” for the duration of the timer. ● Calibration performed with supplied test leads. inverter 820 Hz, 2mA approx.